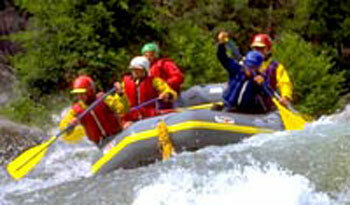 ‘Raging River’ in the local dialect, aptly describes one of the best whitewater runs in the world. Only recently opened for commercial rafting the Marshyangdi is one of the next generation of rivers in Nepal,it is steeper and with more continuous stretches of rapids. While driving to the raft put-in point, there are great views of the Manaslu and Annapurna. The scenery is breathtaking! From Ngadi, downstream to the end of the trip at Bimalnagar it is all solid whitewater. Rapids are steep, technical, and consecutive, making the Marshyangdi a serious undertaking. For people looking for a trip with a lot of demanding whitewater and great mountain scenery, the Marshyangdi is hard to beat. This is the river that demands respect.